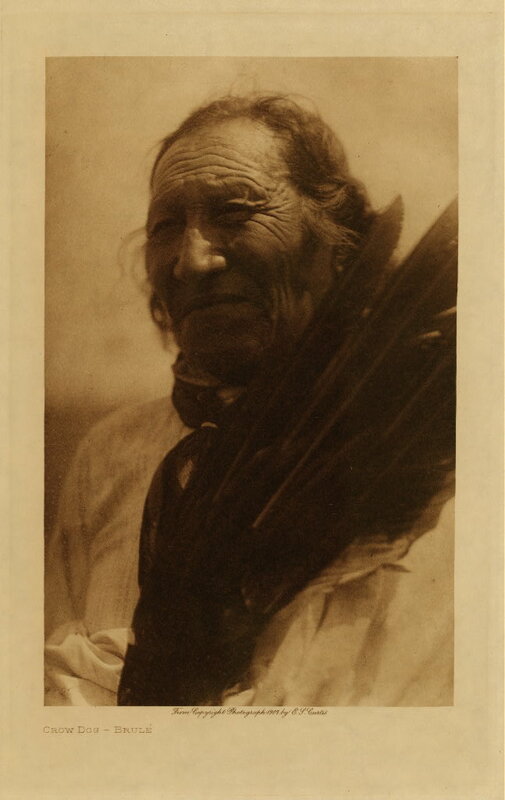 I´d like to start a thread about Crow Dog, who is well known for his role in the killing of Sicangu Chief Spotted Tail. Crow Dog was a leader in the Brule Orphan Band, the Wablenicha. He was related to other leading Orphan clans like the Iron Shells. According to Leonard, Crow Dog took the name Kangi Shunka Manitou after his first fight with enemies. It means Crow Coyote, not Crow Dog, but an interpreter translated it wrongly and the name stuck. Later at the reservation a census taker gave him the Christian name Jerome, so he´s also known as Jerome Crow Dog in official records. Leonard writes that Crow Dog had two wives. One was Catches Her. 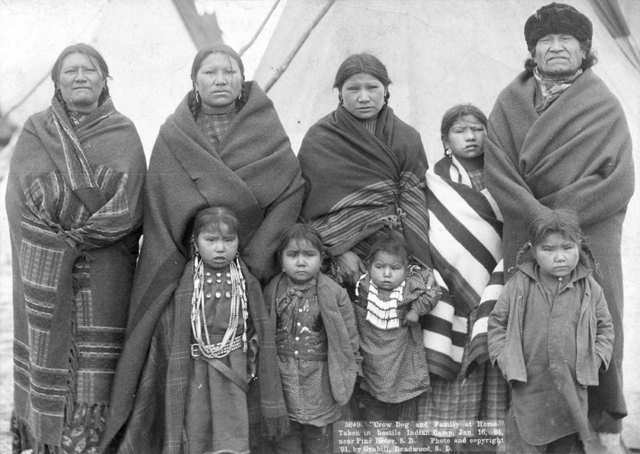 A second wife was called Jumping Elk, a Blackfoot woman. His genealogy remains fragmentary. There´s no mention of Crow Dogs parents. He had two brothers, Brave Bull and a half-brother named Yellow Horse. His cousins include Spotted Tail. Crow Dog was a nephew of Conquering Bear, the famous Wahazha leader killed in 1854. I have a letter from John Colhoff, or White Man Stands in Sight, the Pine Ridge interpreter, dated Dec. 31, 1949, to my late friend Joseph Balmer, of Zurich, Switzerland, which mentions some of Crow Dog's family connections. 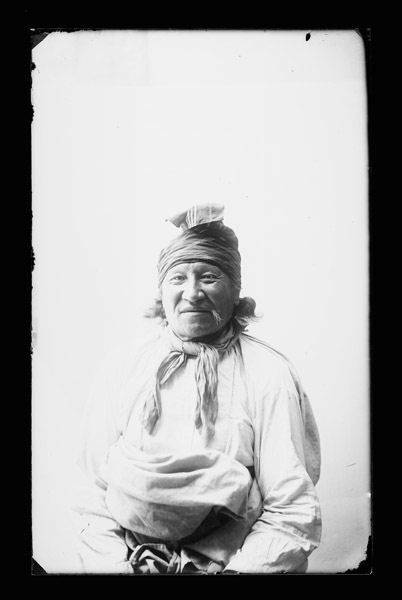 "Kangi Sunka, Crow Dog was the chief who shot and killed Spotted Tail at Rosebud Agency, South Dakota, in August 1881 . . . He was an Oglala but was married to a Rosebud woman, he was related to the famous U.S. [Army] scout Yellow Horse of Herrick, S.D. The Red Willows of Wanbli, S.D. As you know, Yellow Horse was married to one of Red Cloud's daughters [his] No. 1 wife. [Yellow Horse's] No. 2 wife was also Oglala woman, No. 3 was a Rosebud woman. 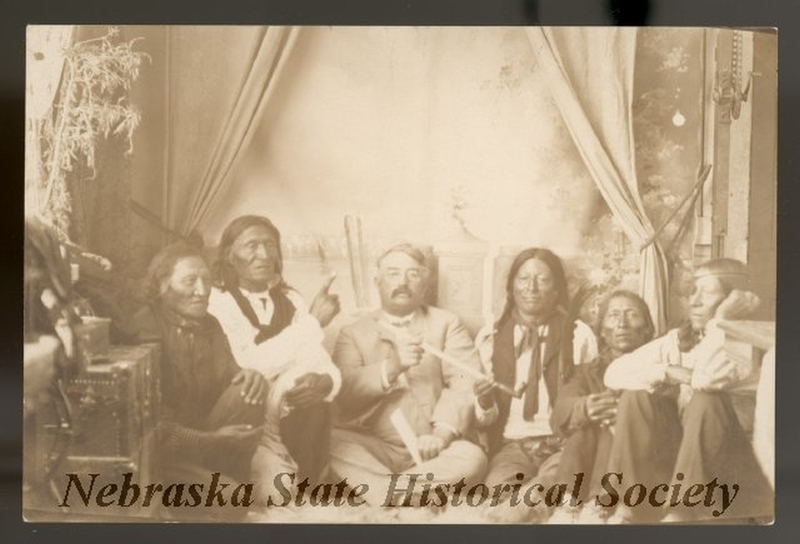 Yellow Bear, Mato gi, the chief of the Spleen band, killed by John Richards, or Reshaw on the North Platte [in 1872] was also a cousin of Crow Dog." John Colhoff told anthropologist William K. Powers that the Red Willow band at Pine Ridge was "originally a part of the Spleen band." So Crow Dog was bon an Oglala, according to Colhoff, with connections to the Spleen band of that tribe. He was related as a "nephew" to Scattering Bear, of the Brule Wazhazha band. Since Scattering Bear and Spotted Tail were related, perhaps as cousins, Crow Dog may have been 'nephew' to Spotted Tail as well. An interesting dynamic. He was also related to the Iron Shell family. Victor Douville told me that Crow Dog and Iron Shell were related to each other as cousins or brothers-in-law, he wasn't sure which. So-o-o-o, while inviting more feedback from relatives, it looks like one of Crow Dog's parents was an Oglala of the Spleen band, possibly a sibling of the chief Black Hawk ('father' to Yellow Bear); and his other parent was a Brule (Wazhazha? ), a sibling/cousin to Scattering Bear. Born c. 1832, he lived in adulthood in the Brule Orphan band of chief Iron Shell, perhaps reflecting his marriage. By 1875 he was recognized as one of the head akichita in the Upper Brule tribe. Haha. Antoine Bordeaux told Walter Camp (in Camp Papers, University of Indiana, microfilm ed.) that Iron Shell's "brothers" were Dog Hawk, Crow Dog, Bell Snake, Moccasin Face, and Brave Bull. 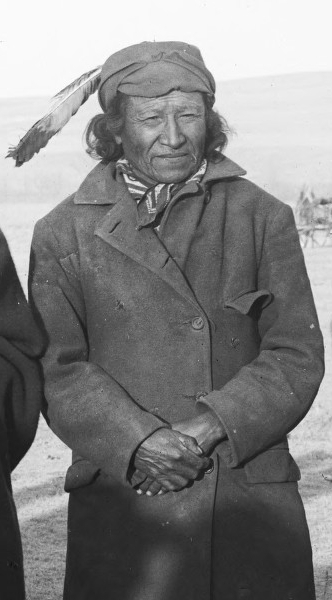 Dog Hawk was the headman of another extended family group within the Orphan band. Bell Snake and Moccasin Face: no more information known to me. 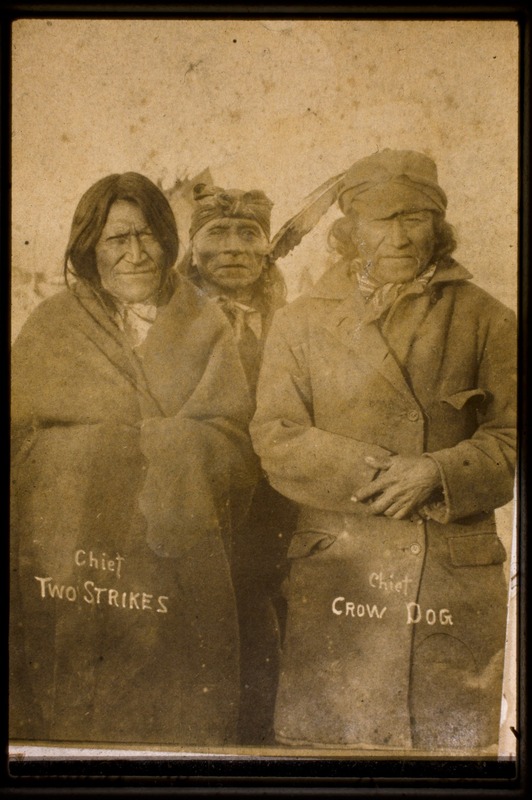 Crow Dog and Brave Bull - noted as brothers by Dietmar above from family information. What I would say is that Crow Dog and Brave Bull were unlikely to have been full brothers - in the European sense - to Iron Shell. They were more likely to be classificatory brothers, for instance sons of Iron Shell's father's brother or his mother's sister. But this would fit Victor Douville's suggestion of a 'cousin' (European sense) connection btw Crow Dog and Iron Shell. The artist DeCost Smith, seeing Crow Dog in 1884, noted he was an affable man who tried to use a few English words in his conversation. He "habitually wore a six-shooter on his right hip... There was nothing Indian about his dress, which consisted of a soft black hat, black shirt and dark trousers tucked into high-heeled cowboy boots... He had a thin beard, and his hair which hing loose just below his ears was curly, an unusual thing in an Indian." He goes on to say that when he met him again, some 18 years later, he wore his hair "long in the Indian fashion... His face was beardless; he wore blanket, leggings and moccasins, and he did not attempt any English. Another photo - taken at the same time as the last one Dietmar posted above. In Leonard Crow Dog´s book it is stated that Henry CD´s great-grandfather on his mother´s side was Nahca Cica, Little Chief. If I got it right he then was the father of Crow Dog´s wife, possibly Catches Her. Was there a Little Chief in the Iron Shell family? 1 Long Chin born 1806 in Brule Sioux. He married unknown. 1 Long Chin Oglala, born 1806 in Brule Sioux. He married unknown. 2 Brave Bear Oglala born 1809 in Oglala Sioux; died 19 Aug 1854 in Ft Laramie, Wyoming. He married (1st) Four Times born in Oglala Sioux, daughter of Red Cloud and Northern Cheyenne Woman; (2nd) Returns Last, daughter of Red Cloud and Northern Cheyenne Woman. (1) Afraid Of Bear, born 1841 in Oglala Sioux; died 9 Jan 1913 in Pine Ridge, Shannon, South Dakota. He married (1st) Eagle; (2nd) Moves Lodge. (2 ) George Sword, born 1847 in Oglala Lakota; died 18 Nov 1910 in Pine Ridge, Shannon, South Dakota. He married Lucy Ann (Different Eagle) Sword. (3)	Poor Dog, died 1876 in Oglala Lakota Nation. (4)	White Calf, born in Oglala Lakota Nation. (5)	Fast Horse, born in Oglala Lakota Nation. (7)	Bad Nostrils born in Oglala Lakota Nation. (8)	Bear Runs Fearless, born in Oglala Lakota Nation. 3. Red Leaf Oglala, born 1812 in Oglala Sioux Nation. He married (1st) Spotted Tail Sister (Long Woman) born Sicangu Brule, daughter of Tangle Hair and Walks With Pipe; (2nd) Fight All The Time. Brings Her Horses, born 1849 in Oglala Sioux. She married unknown. 1833-1910. Crow Dog was present when CRAZY HORSE was killed at Fort Robinson, Nebraska, in 1877, he helped prevent a retaliatory attack on U.S. Army soldiers at the fort. He was police chief at the Rosebud Reservation in 1879-1880, during which time he assassinated SPOTTED TAIL. Crow Dog was born at Horse Stealing Creek, Montana Territory, into a family of esteemed warriors. Before submitting to reservation life, he made his reputation in battle. As the Sioux were confined on reservations following the CUSTER battle at the Little Bighorn, dissension arose among some of their leaders. 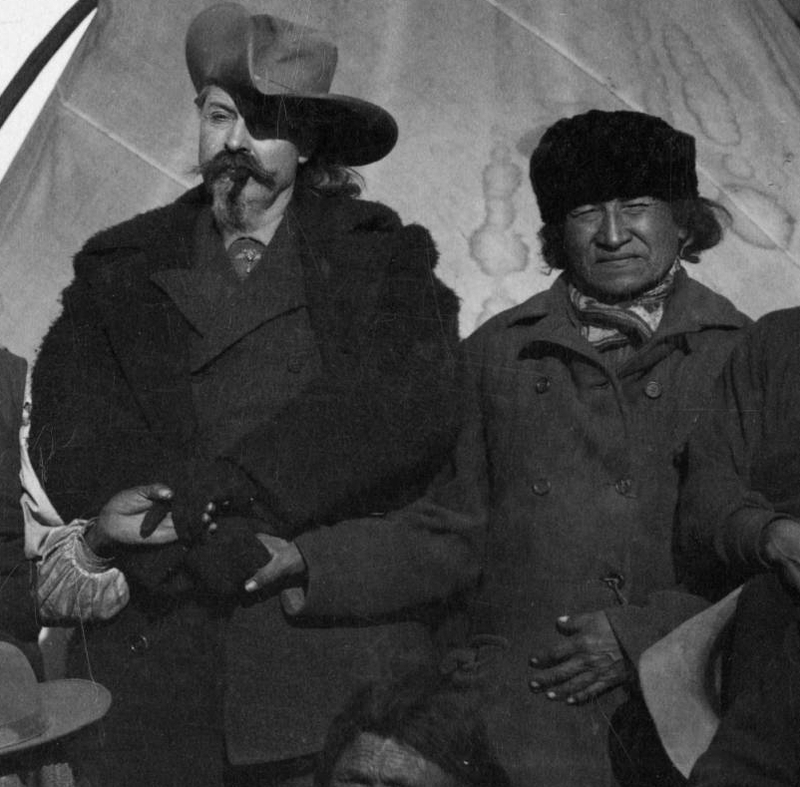 On one occasion, Spotted Tail was accused by RED CLOUD of pocketing the proceeds from a sale of tribal land. Crow Dog heard rumors that Spotted Tail was selling Lakota land to the railroads, building himself an enormous white-styled mansion with proceeds. In mid-July 1880, Spotted Tail was called before the general council by Crow Dog's White Horse Group, where he denied the charges. The council voted to retain him as head chief, but Crow Dog continued to assert the chief's complicity in various crimes against the people. 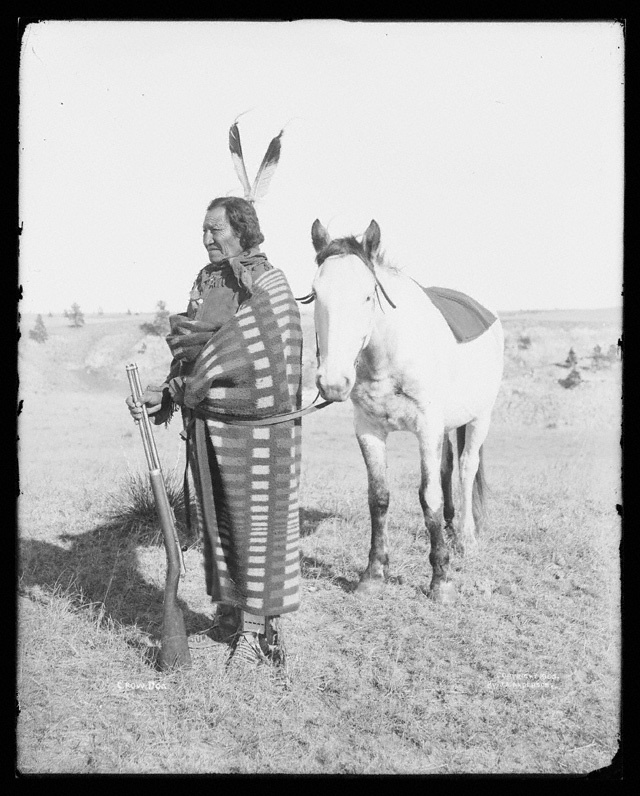 Crow Dog carried out his own death sentence on Spotted Tail on August 5, 1881. Blood money was paid in traditional BRULE fashion for the crime. Crow Dog was also convicted of murder in a Dakota Territory court; he was later freed on order of the U.S. Supreme Court, which ruled that the territorial government had no jurisdiction over the crime. 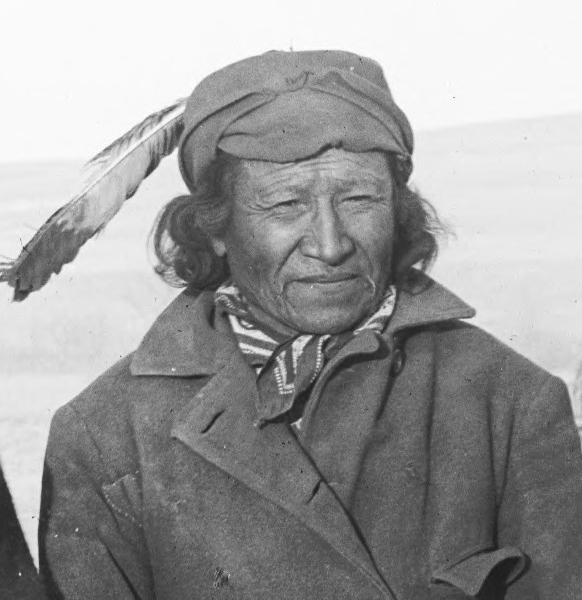 Later, Crow Dog was one of the leaders in popularizing WOVOKA's Ghost Dance among the Lakota. Crow Dog adopted the religion from SHORT BULL. Crow Dog vociferously opposed U.S. Army occupation of South Dakota Indian reservations and was one of the last holdouts after the massacre of BIG Foot¿s people at the Wounded Knee during December 1890. Crow Dog spent the last years of his life in relative peace on the Rosebud Sioux Reservation in South Dakota. Consequently, Crow Dog was told by his cousin, Black Crow, that he had to live separately from the tribe for the rest of his days and that the next four generations of his family also would be ostracized. (1) Jerome Crow Dog, born 1853 in Oglala Sioux. He married (1st) One Who Walks With Stars Crow Dog; (2nd) Holy Cane Crow Dog. (2) Ghost Dog, born 1855 in Oglala Sioux Nation. He married Sarah. Nellie Crow Dog, born Apr 1870 in Oglala Sioux, South Dakota. (3) Alexander Crow Dog, born Oct 1885 in Oglala Sioux, South Dakota. (4) John4 Crow Dog, born 1869 in Oglala Lakota Sioux. He married (1) Mary (Arm) Crow Dog; (2) Jennie (Little Bear) Crow Dog. Dog Hawk, born 1839 in Oglala Lakota Sioux. He married (1st) Nation, born 1842 in Oglala Lakota Sioux; (2nd) Little Elk, born 1857 in Oglala Lakota Sioux. And pg 316-17 Hollow Horn Bear, son of Iron Shell, was now the Chief of the Orphan's; but in that group the most experianced and influential leaders were Crow Dog and Dog Hawk, both whom hated Spotted Tail. (3)	Little Woman, born in Oglala Lakota Sioux. Bull Tail, born 1770 in Brule Sioux, Minnesota; died Aug 1851 in Upper Platte, son of Crooked Hand. He married unknown. Iron Shell, born 1808 in Sioux Nation, Brule. He married Oglala Woman. Little Chief, born 1823 in Oglala Lakota Sioux. He married (1st) unknown; (2nd) Over The Ridge; (3rd) Elk Woman. 2. Iron Shell, born 1808 in Sioux Nation, Brule. He married Oglala Woman, born in Oglala Lakota Sioux. Iron Shell, born 1845 in Sioux Nation, Oglala. He married (1st) Kiss Once; (2nd) Lizzie. Hollow Horn Bear, born 1850 in Oglala Brule, Rosebud, South Dakota; died 1913 in Washington D.C.. He married Good Bed . 3. Little Chief, born 1823 in Oglala Lakota Sioux. He married (1st) unknown; (2nd) Over The Ridge, born 1839 in Oglala Sioux Nation; (3) Elk Woman, born 1844 in Oglala Sioux Nation. Cook Her, born 1843 in Oglala Lakota Sioux. She married Crow Dog . Little Chief, born 1845 in Oglala Sioux Nation. He married Woman . 4. Iron Shell born 1845 in Sioux Nation, Oglala. He married (1st) Kiss Once, born 1848 in Oglala Sioux Nation, Wyoming; (2) Lizzie, born 1858 in Oglala Sioux, Wyoming; died 9 Apr 1935 in Pine Ridge South Dakota. William Iron Shell, born 1876 in Rosebud. He married Gladys Iron Shell. Peter Iron Shell, born 1877 in Brule Nation. He married (1st) Alice Iron Shell; (2nd) Hannah (Eagle Man) Iron Shell. Frank4 Iron Shell, born 1882 in Rosebud Sioux. He married (1st) Della Iron Shell; (2nd) Fannie ((---)) Iron Shell; (3rd) Lulu Iron Shell; (4th) Gladys Iron Shell. 5. Hollow Horn Bear, born 1850 in Oglala Brule, Rosebud, South Dakota; died 1913 in Washington D.C.. He married Good Bed, born 1858 in Cheyenne Nation; died 1921 in Rosebud Sioux. 1850-1913. pg 74 & 316-21 Spotted Tail's Folk Iron Shells son. Hollow Horn Bear fought with the leading chiefs of the Plains against subjugation until the 1870s; after that, he favored peace with the whites and became something of a celebrity along the East Coast. 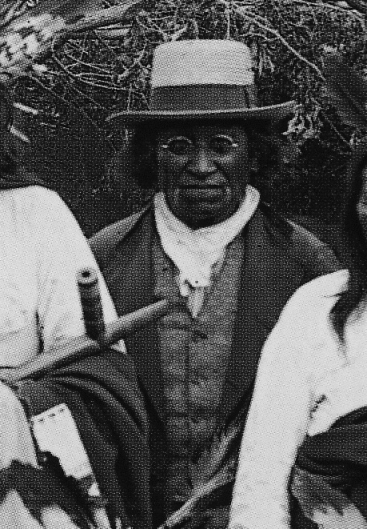 In his later years, Hollow Horn Bear attended several official functions as a Native representative, including two inaugural parades. His likeness appeared on a fourteen-cent stamp as well as on a five-dollar bill._Born in Sheridan Country, Nebraska, a son of Chief Iron Shell, Hollow Horn Bear earned his early fame as a warrior, he raided the Pawnees at first then aided other Sioux leaders in harassing forts along the Bozeman Trail, between 1866 and 1868, when the Treaty of Fort Laramie was signed. During this time, he gained fame as the chief who defeated Lieutenant William Fetterman. 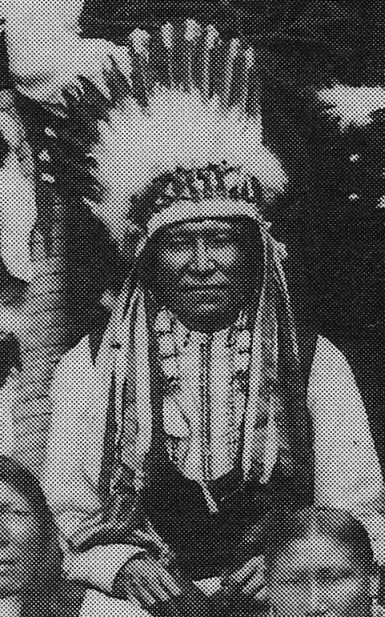 Hollow Horn Bear was appointed as head of Indian police at the Rosebud Agency, South Dakota; in this role, he arrested Crow Dog for the murder of Spotted Tail. Hollow Horn Bear also became involved in treaty negotiations because of his oratorical abilities._In 1905, Hollow Horn Bear was invited to take part in the inauguration of President Theodore Roosevelt. In 1913, he led a group of Indians to the presidential inauguration parade for Woodrow Wilson. On that visit, Hollow Horn Bear caught pneumonia and died. Born 1850. First war-party at twelve against Pawnee. At nineteen he took the pipe and led a party, which killed a number of Pawnee wood-haulers. Struck a first coup-"kill right"-in that battle. After that his father, Iron Shell, desired him to take that name, but he said that he would take his grandfather's name instead, and make the name Hollow Horn Bear good. During his career as a warrior, he counted coup many times and participated in twenty-three fights with Pawnee, Omaha, Ponca, Ute, Arikara, and United States troops. He was present at the Custer fight. John4 Crow Dog, born 1869 in Oglala Lakota Sioux. He married (1st) Mary (Arm) Crow Dog; (2nd) Jennie (Little Bear) Crow Dog. 8. Little Chief, born 1845 in Oglala Sioux. He married Woman, born 1846 in Oglala Lakota Sioux. Gilbert Little Chief, born 1871 in Oglala Lakota Sioux. He married Alice Little Chief. James Little Chief, born 1875 in Oglala Sioux Nation. He married Alice Little Chief. Thanks, LaDeane. An amazing spread of data. Just one correction, the Brave Bear who married Red Cloud's sister and was the father of George Sword and others - he is not the same man as Brave Bear/Conquering Bear/Scattering Bear. The latter was a Wazhazha. The other, who died in 1874 according to a statement by his son George Sword was an Oglala, Bad Face band. 1. Red Cloud, born 1778 in Oglala Sioux Nation, son of Red Cloud. He married (1st) Northern Cheyenne Woman, born in Cheyenne Nation; (2nd) Oglala Woman, born in Oglala Sioux Nation. (1)	Four Times, born in Oglala Sioux Nation. She married Brave Bear. (2)	Returns Last, born in Oglala Sioux Nation. She married Brave Bear. (4)	Walks On, born 1801 in Oglala Sioux Nation; died 1830 in Oglala Sioux Nation. She married He Bear. (5)	Daughter of2 Red Cloud, born in Oglala Sioux Nation. She married Red Dog Horse. Four Times, born in Oglala Sioux Nation. She married Brave Bear, born 1809 in Oglala Sioux Nation; died 19 Aug 1854 in Ft Laramie, Wyoming, son of Oglala and Walks As She Thinks. (1)	Afraid Of Bear, born 1841 in Oglala Sioux Nation; died 9 Jan 1913 in Pine Ridge, Shannon, South Dakota. He married (1st) Eagle; (2nd) Moves Lodge. (2)	George Sword, born 1847 in Oglala Lakota Nation; died 18 Nov 1910 in Pine Ridge, Shannon, South Dakota. He married Lucy Ann (Different Eagle) Sword. Returns Last, born in Oglala Sioux Nation. She married Brave Bear, born 1809 in Oglala Sioux Nation; died 19 Aug 1854 in Ft Laramie, Wyoming, son of Oglala and Walks As She Thinks. (1)	Fast Horse, born in Oglala Lakota Nation. (3)	Bad Nostrils, born in Oglala Lakota Nation. (4)	Bear Runs Fearless, born in Oglala Lakota Nation. Take this into consideration-Chief Red Cloud’s parents died ABT 1825-6.
my point was that Brave Bear the father of George Sword (bn 1847) and his brothers was a Bad Face Oglala, married to a 'sister' of Red Cloud's. You correctly identify those children in your post. George Sword gave his father's Lakota name as Mato Kagishni Inyanke, which literally translates Bear Runs Without Fear - loosely, Brave Bear. Indeed he was born early in the 19th century. Afraid of Bear (born 1843), another of his sons, told JR Walker that his father was born about the Year the Good White Man Came, a winter count year matching about 1802-03. 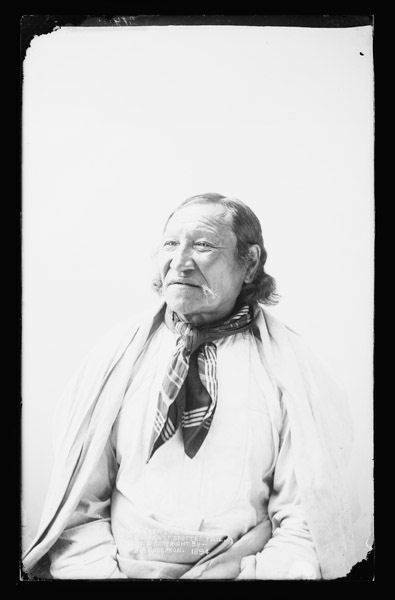 This "Brave Bear", the brother-in-law of Red Cloud, who died on April the first, 1874, according to George Sword, was a different man from the Wazhazha leader whose Lakota name was Mato Wayuhi. His name is conventionally translated as Conquering Bear or Brave Bear, but the verb -yuhi means 'scattering' as e.g. a bear scattering earth when it digs up roots. That's why I translate that name as Scattering Bear. It also saves on confusion with other people with similar names. Scattering Bear was the leader selected as the Teton head chief by the treaty commission at Horse Creek in 1851, and who was killed by Grattan's troops in 1854. He too must have been born early in the 19th c. About 1805-1810 seems the right frame to me. So he and Brave Bear were near contemporaries, but they were two different men. It was the latter, the Oglala Brave Bear who had the marriage connection to Red Cloud's sister. I know there was an Oglala called Brave Bear born in the 1830s. I am unsure of his family background, and would appreciate any help in identifying his parentage. 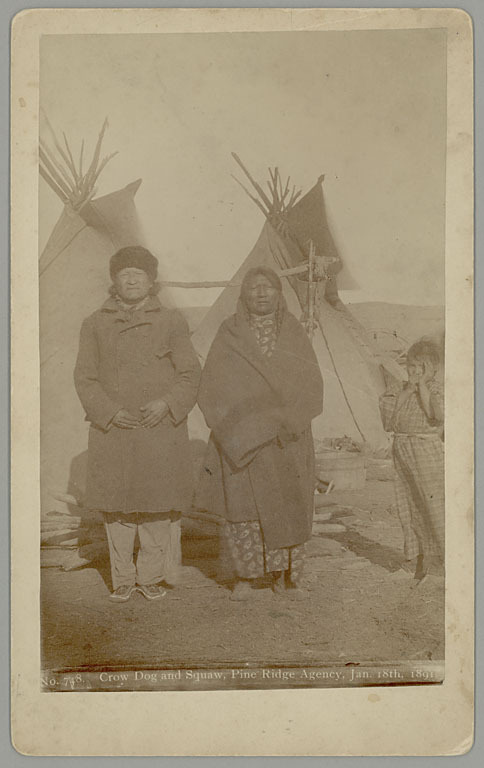 looking at the 1891 Crow Dog pictures, credited to Grabill or Moreledge, where he's together with Two Strike and another man identified as High Hawk, I would say, comparing these pictures with the noted 1872 Gardner series, that this man is instead Gassy. There was nothing Indian about his dress, which consisted of a soft black hat, black shirt and dark trousers tucked into high-heeled cowboy boots which fitted his feet admirably. He had a thin beard, and his hair which hung loose to just below his ears was curly, an unusual thing in an Indian. He notes that when he met him again, 18 years later, his hair was long, his face was beardless and he wore blanket, leggings and moccasins. I came across this illustration in the James Taylor collection. I wonder if it's the work of Smith, since it's clearly a younger man than in the Wounded Knee photos and his hair and beard match the description? I have to admit, I wouldn't have thought that by 1884, dress of hat and trousers was that uncommon on the reservation, Boots, yes.